(Highest quality system) Made by Watergeneral, specialized in making RO systems for 16+ years. Very reliable units, guaranty to perform. 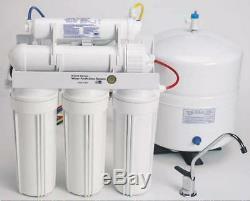 WaterGeneral Reverse Osmosis Water System Made in USA. 5-stage 85 gal/day Reverse Osmosis Water System (for drinking water) + Bonus Pressure Gauge. This system is a complete system ready to be installed. It includes all filters, storage tank 4gal. Is the preferred partner of Honeywell Inc. We have very knowledgeable tech support & Customer service team if you have questions regarding to this listing. We also guarantee the performance of the RO systems. We carry all parts and components. This is a complete system with all filters, storage tank, faucet, tubing, feed water adapter, drain saddle valve, installation manual. 1st stage: high capacity, 5 micron sediment filter, to remove sediment, rust, sand, (replace every 6 - 12 months). 2nd stage: high capacity carbon filter , coconut shell carbon block filter removes chlorine, taste, & chlorine (replace every 6 - 12 months). 3rd stage: high capacity carbon filter, coconut shell carbon block filter further removing chlorine to ensure 100% removal of chlorine (replace every 6 - 12 months). 4th stage: TFC-75 Premium membrane we use genuine US MEMBRANE membrane filter, 75-85 gal/day, it removes 95% to 98% of all chemical, dissolved solids in tap water. 5th stage: high capacity final stage inline carbon filter , granular activated carbon, to improve taste of water. System Dimension: RO unit: 15" length, 16" height, 5.5" depth ; Storage tank: 10.5" diameter, 15 height. FREE bonus Pressure Gauge: It's helpful in monitoring. Operating pressure of the RO system. When to replace sediment & carbon filters. RO Storage Tank: 4 gallon tank, holding 3 to 3.2 gallons of water depending on water pressure, NSF listed tank, stainless steel connector, FDA approved butyl rubber water bladder, pre-charged with compressed air (no additional charging or adjustment is necessary). Dimension: 10.5" diameter x 15" tall. Automatic-Shut-Off Valve is included, when storage tank is full, the system shuts off to prevent wastage of water going to the drain. Feed Water Adapter: for under the sink installation, we give you the adapter with valve to put in between the cold water line. Our adapter has several advantages over the self-piercing valve. Our adapter will not clog up like the needle point piercing valve. Also our adapter does not require putting a hole in the pipe. You can easily replace the valve or relocate the valve without changing your piping, unlike the other self-piercing valve, where once it punctures a hole you cannot replace the valve, then you need to replace the pipe and the valve. Standard Long Reach Faucet: chrome. A 5/8" or 1/2" hole or larger hole is required on the countertop. We use a fixed rate flow restrictor to accurately restrict the drain line and create proper working pressure for the operation of the reverse osmosis process. Therefore, a more efficient and favorable pure water to drain ratio is achieved at 1:3. We have abandoned the type of flow restrictor that has a black lever on top for flushing since it is not an accurate flow restrictor. The system flushes itself when it is making water. In most cases a manual flush valve is not required. However, it is beneficial to manually flush the membrane if the water supply is from well or very hard water, above 600 ppm of TDS or Hardness. All reverse osmosis systems, residential or commercial, are required to have drain water when making pure water. Our RO systems have built-in auto-shut-off valve so when the storage tank is full, the system shuts off automatically. The ratio of pure water to drain water for our RO systems are 1:3 (calculated). Average RO systems are typically 1:4, so our RO systems run more efficiently. Minimum water pressuer required to operate the system is 45 PSI. Ideal pressure is 85 PSI. This system is intended to be operated with under 400 ppm tap water. If you have higher ppm in the water, the purified result will be affected and we can not guarantee the purification ratio. The item "Watergeneral RO 585 REVERSE OSMOSIS FILTER SYSTEM HOME DRINKING + Bonus P gauge" is in sale since Tuesday, January 7, 2014. This item is in the category "Home & Garden\Kitchen, Dining & Bar\Small Kitchen Appliances\Water Purification\Water Filters". The seller is "filterdirect" and is located in Santa Ana, California. This item can be shipped to United States, Canada, United Kingdom, Denmark, Romania, Slovakia, Bulgaria, Czech republic, Finland, Hungary, Latvia, Lithuania, Malta, Estonia, Australia, Greece, Portugal, Cyprus, Slovenia, Japan, China, Sweden, South Korea, Indonesia, Taiwan, Thailand, Belgium, France, Hong Kong, Ireland, Netherlands, Poland, Spain, Italy, Germany, Austria, Israel, Mexico, New Zealand, Philippines, Singapore, Switzerland, Norway, Saudi arabia, Ukraine, United arab emirates, Qatar, Kuwait, Bahrain, Croatia, Malaysia, Colombia, Costa rica, Dominican republic, Panama, Trinidad and tobago, Guatemala, El salvador, Honduras, Jamaica, Bahamas, Viet nam.